When making scrambled eggs or omelets, try using a combination of whole eggs and egg whites. Cooking and baking are two of my favorite pastimes. I like that it’s creative, often less expensive then eating out, and sometimes healthier. Not every homemade recipe is nutritious, but with a few simple changes I’ve been successful in making some recipes lower in fat and calories. One tip is to substitute high-fat dairy products, such as whole milk, regular cheese, or cream cheese with fat-free or low-fat dairy products in recipes. This reduces fat while still providing protein, vitamin D and calcium. Instead of using sour cream, try non-fat plain Greek yogurt. This type of yogurt is thick and creamy and has a tangy flavor, not to mention it’s higher in protein than most regular yogurts. 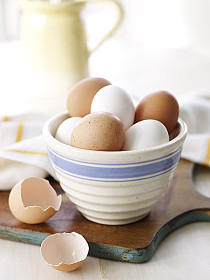 You can also replace whole eggs with ¼ cup of egg substitute or 2 egg whites for each egg. When making scrambled eggs or omelets, use a combination of whole eggs and egg whites. You will still get the fat-soluble vitamins from the egg yolk but less cholesterol. Modifications in baking can be more challenging but are definitely possible. When baking, use the same amount of applesauce or fruit puree in place of the oil, butter or shortening. Try reducing the sugar by cutting the amount in the recipe in half. When making changes to any recipe, it’s important to remember that products may turn out differently. I’d suggest practicing ahead of time, making only one change at a time, and keeping a record of what you have changed and how the product turned out. Experimentation is part of the fun in the kitchen, so try some of these healthy tips or create your own. Happy cooking! Celina Scala, MS, RD, LDN, CNSC, is a nutrition support dietitian who works in the Neonatal Intensive Care Unit at Rush University Medical Center. This entry was posted in Food and Nutrition and tagged cooking, dietitian, recipes. Bookmark the permalink. Right nutrition is so important! We could lessen so many diseases in this country by watching what we eat and how it is prepared. Happy Cooking!